Virtual reality is still a few months away from full retail release, but that hasn’t stopped the hype train from slowly building up some steam. While Sony’s Project Morpheus VR headset won’t get into stores until sometime next year, Studio Wildcard, with Sony’s blessing, has already announced a Morpheus compatible game that’s both online and full of dinosaurs. 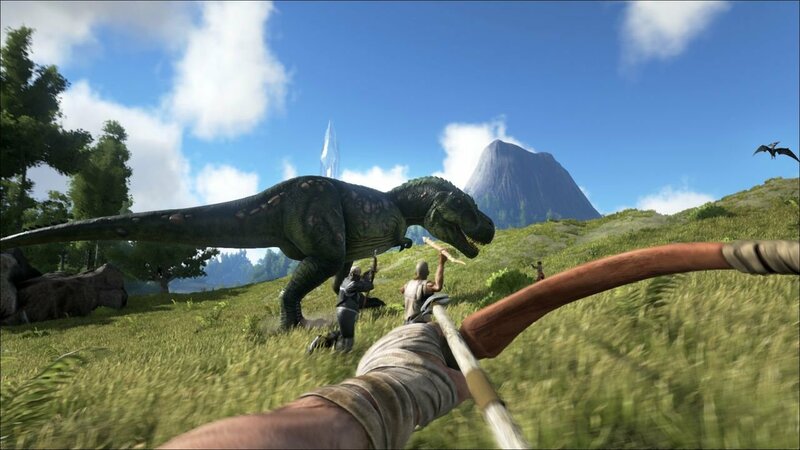 It’s called Ark: Survival Evolved, and while it won’t REQUIRE a VR headset to play (it’s also being made for the Xbox One and PC), it’s being designed with full VR compatibility, so you’ll see the game at its best if you’re willing to get—and wear—the gear. The game is online only, with a combination of PvP and PvE gameplay, although it’s supposedly not all just shooting at dinosaurs and other people. There’s an RPG-esque element in that your stats are tracked and stored on a server, and there’s an exploration component as well. There’s also supposed to be an option to play on a “private” server if you just want to play by yourself or only friends without outside interference from other players. As to be expected, Ark is a game in first person perspective, but the added immersion of virtual reality could make this a special experience if it’s properly applied. Wildcard has already hinted that dinosaurs can be tamed and ridden, including the mighty T-Rex, but the one that really has my attention is the Pteranodon. Flying on a dinosaur in VR sounds incredibly cool, and while it’s not quite the same thing, with a little imagination and going on Spotify to stream the theme to The Neverending Story, you too can scream out “Get ‘em Falkor!” and pretend you’re chasing bullies in downtown. Or maybe that’s just particular to me.